Lothian Motorcoaches, a subsidiary of Lothian launched in June 2018, has announced a new partnership with Musselburgh Racecourse. 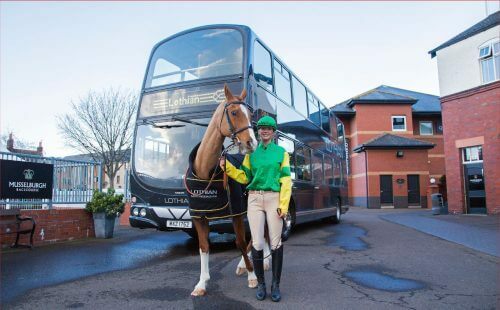 Lothian Motorcoaches will operate free shuttle services for racegoers across 26 race meets including the bet365 Scottish Cheltenham Trials. The services will run from Newcraignhall and Wallyford train stations direct to the racecourse. The double-decker vehicles will also provide WiFi to passengers travelling to the venue. Willie Hamilton, Coaching and Touring Manager, Lothian Motorcoaches said: “Our team are fully committed to delivering high standards of service for each and every one of our customers and our partners. Philip Duncan, Operations Manager, Musselburgh Racecourse, said: “We strive to make the visitor experience at Musselburgh as enjoyable as possible and what better way to start a day at the races than being transported from local railway stations in comfort?